Eddie Chapman was a charming criminal, a con man, and a philanderer. He was also one of the most remarkable double agents Britain has ever produced. Inside the traitor was a man of loyalty; inside the villain was a hero. The problem for Chapman, his spymasters, and his lovers was to know where one persona ended and the other began. Based on recently declassified files, Agent Zigzag tells Chapman’s full story for the first time. It’s a gripping tale of loyalty, love, treachery, espionage, and the thin and shifting line between fidelity and betrayal. BEN MACINTYRE is a writer-at-large for The Times of London and the bestselling author of A Spy Among Friends, Double Cross, Operation Mincemeat, Agent Zigzag, The Napoleon of Crime, and Forgotten Fatherland, among other books. Macintyre has also written and presented BBC documentaries of the wartime espionage trilogy. 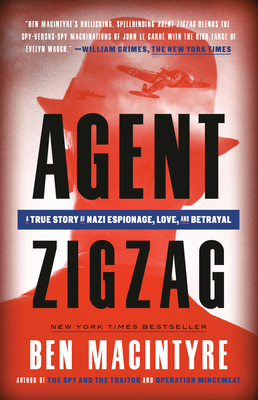 "Fact sounds like fast-moving fiction in this espionage saga of a man who was probably the most improbable double agent to emerge in World War II. ... The author has written an enormously fascinating book about an enormously fascinating man. The late Eddie Chapman would have been delighted to at last capture the limelight denied him by the restrictions of his wartime profession. The question now is, who will make the movie and who will play the lead? Too bad Errol Flynn is dead." "Superb. Meticulously researched, splendidly told, immensely entertaining and often very moving." "A preternaturally talented liar and pretty good safecracker becomes a “spy prodigy” working concurrently for Britain’s MI5 and the Nazi’s Abwehr. London Times newsman and popular historian Macintyre (The Man Who Would be King: The First American in Afghanistan, 2004, etc) reports on the life and crimes of the late Eddie Chapman using interviews, newly released secret files and, cautiously, the English spy’s less-reliable memoirs. Just launching his criminal career when World War II began, the dashing adventurer was jailed in the Channel Island Jersey. Volunteering his services to the occupying Fatherland, he was taken to France and schooled in the dark arts of espionage and the wicked devices of spies by the likes of convivial headmaster Herr von Gröning and spymaster Oberleutnant Praetorius. Then the new German agent signed a formal espionage contract (under which his expected rewards were to be subjected to income tax). Dropped in England’s green and pleasant land to commit sabotage, he instead reported directly to His Majesty’s secret service. There they called their man 'Agent ZigZag.' The Germans had named him “Fritzchen.” Little Fritz, with the help of a magician, fooled his Nazi handlers into believing he had wrecked an aircraft factory. After a crafty return to Germany, he made another parachute drop home to report on an anti-sub device and the accuracy of the new V-1 flying bomb. The energetic adventurer from a lower stratum of British society was being run by Oxbridge gentlemen and by aristocrats of Deutschland at the same time. Or perhaps he was running them. Adorning his exploits were several beautiful women and an Iron Cross. It is a remarkable cloak-and-dagger procedural and a fine tale of unusual wartime employment…. One of the great true spy stories of World War II, vividly rendered."